Let me say that I have beaten the game on the normal setting as well as a couple of missions on the Expert Difficulty. Not only that, I have played online at least 150 matches, so I’m fairly knowledgeable. This is one of the few games that I bought based on the demo I played of it. 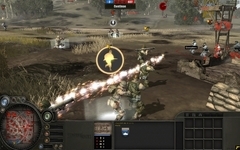 A pre-release demo was put on a PC Gamer disk. I hadn’t heard of the game, yet I tried it once. That transition from CGI to in-game engine had won me at the start, and the graphical bonanza with enthralling action grabbed me deeper. I knew this would be a good game. I put it on my want list. Later, I checked out reviews, and after seeing a 96% from that same magazine, I knew an instant buy was made. But let me give you my unabridged feeling of the full game. This will be from pre-expansion, since I will save that for another time. This review will however take patch 1.71 into account for Direct X 10, though I’m not sure of the balancing at this point or currently anyways, so it is all relative. Storyline: Able Company has just landed on the beaches of Normandy. Fox Company joins you. Both must fight their way inland to put an end to the Nazi regime. Missions have you doing various tasks such as holding a hill, eliminating panzer tank divisions, capturing towns and raiding V2 rocket battery sites. There is a story to this RTS, and most (good) RTSes I’ve played do have stories, so this was not a surprise. I was never strongly emotionally attached to the main heroes, but they helped provide some commentary. There are two allied men that serve as the protagonists; Captain Mackay and Sergeant Conti. They basically talk about the plans for the mission and put the camera on the ground-level, so to speak. Overall, story wouldn’t be the reason to plan this game, but it does exist. Graphics: The graphics for 2006 were stellar. Many people, at least from what I heard, though this would be a FPS. (I can’t judge this since I heard about the game just before release), but it could certainly look the part. Both the ground and units are bump mapped, and the lighting looks really good. Bullets wiz by and pick off squad-mates as they dart for cover, Mmmm. Furthermore, graphics interact with game-play many times, setting it apart from most other RTS. One example is that units can take position behind cover to get bonuses, while those out in the open will be pinned, with units prone and immobile accordingly. 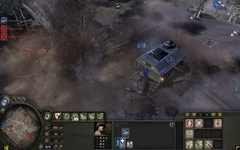 Tanks and vehicles take visible damage if their components are destroyed, with smoking engines, and empty gunner seats. Smoke effects are clean and have many layers of particles. While most look alike, it is understandable, and really isn’t a problem. Once again, graphics interact with game-play in another sector of the game. 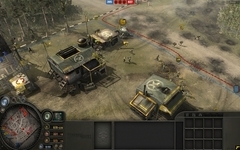 When driving a tank, or even using a well equipped infantry unit, you can blast holes through fences, hedges and walls. This lets both the tank and infantry pass through, and opens up new paths of attack. This seems to happen normally during game-play with explosions, so it isn’t as though you have to think about doing it, though there are times, especially when only infantry are on the field, when you can catch a human player unsuspecting of your unorthodox entrance. Houses are also destroyable, making any occupants at risk of being crushed if their hostel takes too much fire, or has its supports run out. Tanks cannot run buildings over, but they can smash into its walls, removing support, and taking a lot of health out of the building. As you can see thus far, the graphics really matter in this game, as the game-play would not be the same without it, but wait there is still more. Buildings have windows, and while this might seem like common sense, infantry cannot shoot through walls. Thus, if the enemy approaches your fortified building from a side without a window, there is not much you can do about it. While you cannot shoot out at them, they can shoot at you. (For reasons, I’m still not sure why). Killed unit may or may not be dead. They may be severely wounded. In which case you can zoom in and see them struggling for dear life. They may also drop their weapon when downed. Get some medics over there pronto, and you may be able to rebuild a squad of zombies. Efficient and moral, don’t let your men suffer. You may even be able to salvage that dropped weapon before the enemy does. Enough about graphics. As you can see, they are brilliant. And, at this time they could run on an average video card at decent frame-rate, so don’t think it is too powerful for you. But wait… Direct X 10. 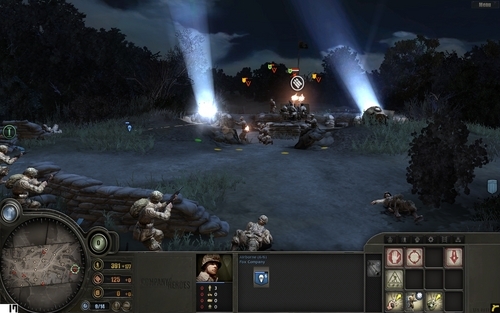 Company of Heroes was one of the first games to be released as Direct X 10 compatible. Let me say, that Company of Heroes doesn’t need Direct X 10 to look amazing, it already does. Even today it holds up quite well even though it has been 3 years since release. Better than I can say for some games. But when turning Direct X 10 on for CoH you do get some bonuses. For one, the smoke supposedly looks better because it won’t intercept buildings like most textures do to 3D objects. Furthermore, all light sources are now dynamic besides the global lighting. This means on night missions the lamps should emit their own independent light, effecting shadows in the vicinity. This also adds additional detail to characters, whom while retaining the same textures, seem to have additional depth. In addition grass has been improved, along with more ground debris to mess with. But, all these extra goods do have a downside. For one the game in that mode runs like a dog, even today. It was bad when the patch for it came out, but now I still think it likes to drop your frame-rate badly. I’m going to say 15 frames are munched on over the DX9 Version. If you have frames to spare, go ahead, but don’t just turn it on for the sake of best quality. When the game looks great already, I feel it just isn’t worth it. I’m not sure if the problem still exists with the clouds and reflections in the water, but I’m going to assume it is currently fixed. Cutscenes: With such a great graphics engine, it is only fair to use it right? Relic has two types of cut scenes, similar to Mirrors Edge. In one, you have a pre-load pre-game cinematics that is stylized as though a watercolor painting. These are great looking, though are not “action packed” They are a moment to withdraw from the battles, and think of the entire operation, sort of a narrative flashback. 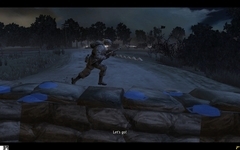 Moving troop markers and arrows compliment the cutscenes. The second type of cutscene are the in-game ones. These are slightly dynamic too. This I mean, if you destroyed a lot of buildings, the cutscene will show more buildings. 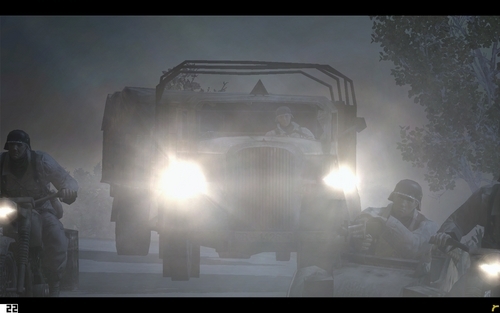 Or, if the cutscene is highlighting a road and you built lots of mines and wire across it, then you will see it. They won’t affect the cutscenes, which is a good thing, trust me, but it’s nice to know it really is in-game, unlike some versions of Resident Evil 4’s cutscenes. The syncing of the voices with the mouth movements is good, what makes it more impressive is to remember that this is an RTS, not a FPS. Thus, any mouth movement is setting the standard in my book. Camera: Control is important in games like this, and it doesn’t fail. You can zoom in to ground level, or pan around units and characters by holding down the ALT key while manipulating the mouse. Pressing Backspace twice will reset your camera quickly if you get caught examining the scenery too much in a firefight. I loved being able to zoom in and out at will, especially with the strong zoom. It let me enjoy the graphics on the characters much more than other games, which may be a few shaded polygons (Ala C&C, even Red Alert 3). I wish that I could have zoomed out a little bit more than the limit, though it is hardly game or strategy breaking. For the most part, the camera will probably remain in its default position throughout the game, but it is nice to have a sense of full control over its placement. Sounds and Voices: Here is where the game definitely impresses. Graphical leaps were going to be a usual anyways, but the method that Relic (the developer) took with sound made me gasp. Here is why; Take Warcraft 3 for example, if you attack an enemy, your highlighted unit will say something and then go attack. Or if you click to move the unit will say something and then move. Or just click on the unit and it will talk. Company of Heroes has all that, but it goes farther. Move your unit, VO, Click on unit; VO, Attack with unit: VO, Getting attacked: VO, idling: VO, Upgrades: VO, Units Dead: VO, and these are just a few instances. Now you may be thinking that with all these Voiceovers there are too many clogging up the sound stream, but you’d be wrong. Sounds that are important are sent over the com to you, such as getting attacked, and buildings completed, but others such as the idling and “storytime” do not. By storytime, I mean that occasionally, moving or idling the unit will say something that relates to what they are doing or just a story. Some of the ones involve made-up characters that you’ll never see but are fun to hear about. (Ala, Bobby shot his head off yesterday.) This is amazing, something completely unimportant, and yet also non-distracting is being said, that is fun to hear. It gives the player a sense that the units are “alive”, as per Relic’s intentions. To hear these stories you’ll have to be zoomed in near the units, so it isn’t something that will happen unless you are trying, or waiting for the enemy assault. These sounds happen appropriately too, there won’t be any storytime if the units are being attacked, though they may mutter some remarks about their current predicament. Units that aren’t even yours may be heard if you zoom in close proximity to them. Now, some games may have 3 different sounds for an action, CoH has more. I’d say there are probably 5 or 6 different voiceovers for an action. Some are different dialogue, but some are the same dialogue but said in a slightly different tone. This guarantees that while you may hear these VOs many times over the course of the game, they aren’t repetitious. I wish most games, RTS or not took this approach. Furthermore, the VOS relate to the situation in a helpful way. You may hear units complaining they are under attack by a halftrack. Not only do you know they are under attack, in the case of Starcraft, but you know by what. Without looking you could rally necessary forces to combat the threat. Another way in which Relic excels in the sound department here. If a unit is talking and you move the camera off of it, it may either fade out, if unimportant, or if it is a critical VO, will be overlayed with static, as if transmitted by radio. Another immersion effect to good use. The Germans speak English in an accent, as well as saying a few lines in actual German with some English equivalents. Both work well, and it beats them all speaking in fake British accents. In regards to other sounds, gunshots ECT. I can’t vouch for the accuracy of the sounds but I will say that they sound good. Explosions ring out, and bullets can be heard whizzing by the camera. Sounds off-screen are also more muted, but audible, fitting if they are the loud explosion of a V1 rocket on the home-base. Units: Here is what really matters, the units and how they interact can make or break an RTS. Let me say, that while this game is not 100% balanced, and will probably never be; it is good enough to play without one unit type getting spammed all the time. There are two armies available, the Allies, and the Wehrmacht. They both play differently but have similarities. Each army can build 4 basic units, a pioneer/engineer squad, a sniper, a mortar team, and a MG crew. These are the same for both armies, though some slight adjustments to the stats, IE the Wehrmacht mortar team has a longer range than the American equivalent, or the American engineers have 3 men instead of the German’s 2. Other than those, there are no “duplicates” between the armies. Each has different tiers with different results. In quantity, the Wehrmacht have more units to build in their hierarchy, yet some units are just more powerful equivalents of older ones. The same applies for the Americans, except that the units are hardier, and so can be upgraded to be effective even at game’s end. This isn’t to say that units become outdated for the Germans, but if not supported early units will die quicker end-game. In Warcraft 3: Basic Unit 1 will always beat Basic Unit 2 in combat 1 on 1. 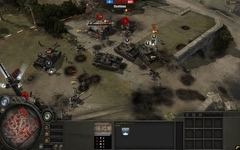 In Company of Heroes: Basic Unit 1 may be stronger than Basic Unit 2, but if Basic Unit 2 is in heavy cover, it may win the fight. Though if Basic Unit 1 rushes the cover, it will take more damage while approaching, but might win in the end. This is what makes the game enthralling, you have to think about unit placement and how one unit compliments the other correctly if you want to win. You have to position your MG behind sandbags, but also perhaps put an anti-tank gun behind it, so that a tank may be tempted to easily take out the MG, but will not know there is a threat in waiting out of sightline. Or you may have to do the same with a flame tank, if enemy infantry is expected to approach from the rear. Another example is supporting mortar teams and anti tank guns with weak scout cars. The cars are fairly useless at fighting once tanks are on the field, but they give a great sight view, and let the other units fire even out of their own viewing range. It is difficult to describe all the different situations, but needless to say, spamming one particular unit is not the most effective. There are basically three types of units, ground units, light armor, and heavy armor. Ground units are the usual infantry, and anti-tank guns that inhabit the world. They can be retreated, granting them resistive bonuses as they dart to HQ, and reinforced at less than the cost of new units. This keeps you on your toes, gauging when to retreat, and when to keep fighting, at the chance of losing a precious unit. Light armor includes half-tracks and Greyhound light tanks. These are not as easily damaged by conventional fire, but they will be killed if left with the enemy’s peashooters. Heavy armor is invincible to machine-guns and ordinary weapons. In this case, you better hope you have some Panzershrek RPGs (for Wehrmacht) or Stickybombs (For American Infantry), at least. Different than other RTSes where GIs or marines could take out tanks no problem with their rifles. It would be a mess to talk about every unit in the game in this review, so let me simply say that there is enough to keep the game strategic, and there are a variety of well-voiced units. Command Trees: As you play through the game, killing the enemy nets you with command points. These can be sent on one of three available upgrade tech trees. Each army has 3 separate ones, so that is when things start to get messy. In Single player the computer will not use the command tree, though you can, so that is not an issue. Command tree bonuses would be given to the computer in that case automatically. Bonuses granted are not of one type. For example, the Germans are granted the ability to reinforce units at their bunkers if the defense command tree is chosen, while the Terror Command tree may get the fiercesome King Tiger Tank as one of theirs. Command trees are very important, as once the decision is made to choose one track, you cannot change it. Thus, you have to think carefully of how the enemy will assault you, and choose the best countering special abilities. Command trees add great replayability online, since it adds a great sense of uncertainty. You may know what units they have, but you may not know what they can call from the air, or summon from the edge of the map to wipe you out, or when. Multiplayer: To be honest, anything besides the Story section is applicable to multiplayer. Up to 8 people can play. As a side note, there is no “Unholy Alliances” which means that Allies will not be sided with Axis forces. This keeps things “simpler” though I still would have liked the option as I could see some crazy potential, though I know that would make balancing the game even more of an impossibility. One problem with multiplayer is that the winner can be decided in bad games in as little as 10 minutes. Since the one who controls more resources can build more, they do build more. But, that’s not the problem. The problem is that by capturing points, they also have the potential to build more units, their pop cap goes up. This basically means that the side that has fewer resource points and thus fewer pop cap cannot even build the same magnitude of an army as the other side, even if they have the resources. This makes the weaker side’s fall quite exponential, as they tip more and more into no ability to resist. With this in mind, the best games are the ones where both sides take heavy losses, and it is never really clear whom is going to win, as every rifleman down is a tip of the balance. There are two multiplayer gametypes, victorypoint and annihilation. Annihilation is as it sounds, destroy your opposing army. Victorypoint has you capturing specific territories that train the opponent's ticket supply. Unlike the Battlefield series, kills don't drain tickets, so camp away. Alas, some Victorypoint games are just Annihilation games at heart since players often build an army, and rush right into your base, removing you from the game, and making the point of tickets null. Conclusion: Great game, great replayability. Multiplayer will keep you on your toes. Graphics are phenomenal, for the time, and even now. Sets new ground for RTSes I’ve played. Somewhat glitchy at points, even with the latest patches (Not gamebreaking like Crysis Warhead). Voiceovers are simply amazing, and don’t make me want to tear my ears out, in fact some of the sayings get stuck in my head. Gameplay keeps you on edge.